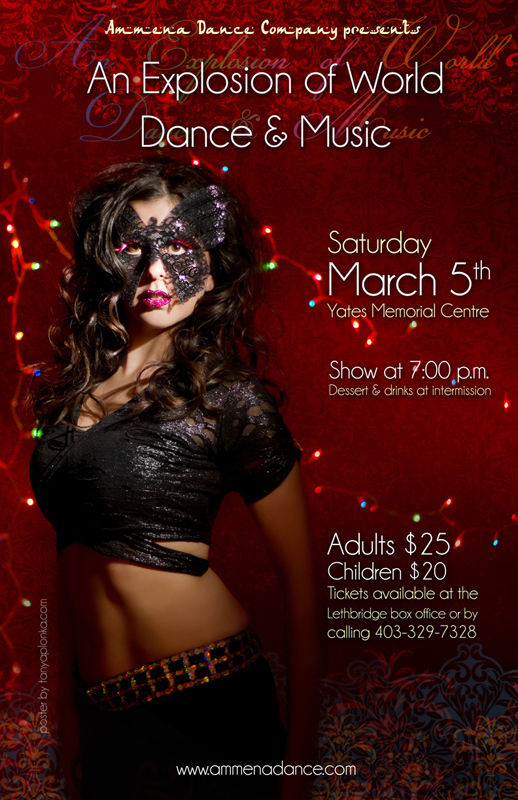 An Explosion of World Dance and Music, our 2015 Lethbridge show! Ammena Dance Company’s “An Explosion of World Dance and Music” 2015 is coming soon! 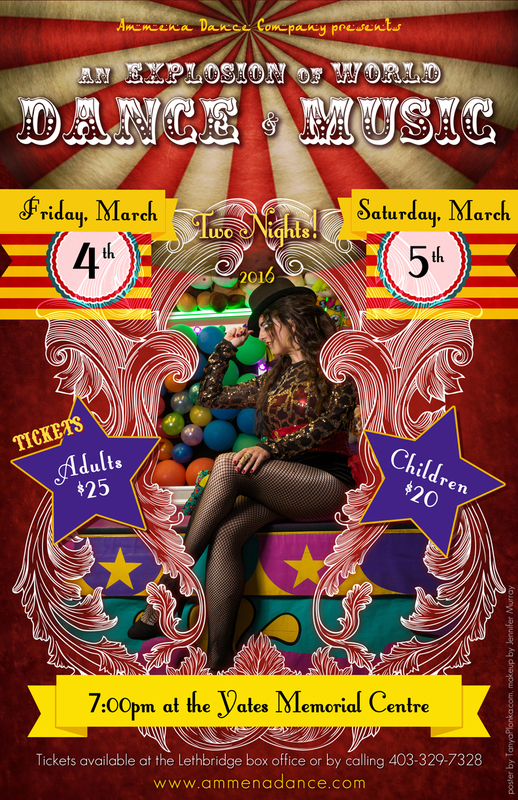 Tickets will be on sale on February 3rd at the Yates Memorial Centre in Lethbridge and this year we are doing two shows again: Friday March 6th and Saturday March 7th! We have a lot of black and red costumes in the show this year, including our awesome broadway tango finale piece, so it was important to get those colors into the poster. Plus, after saying we wouldn’t have a lot of props to dance with this year, Ammena Talhami brought in all kinds of goodies for us! Candles will be a big part of the show, so we covered the floor with them (which were much easier to clean up than rose petals!). This year’s show will feature bellydance, Bollywood, dancehall, burlesque, tango, broadway, and more, so please come check it out! 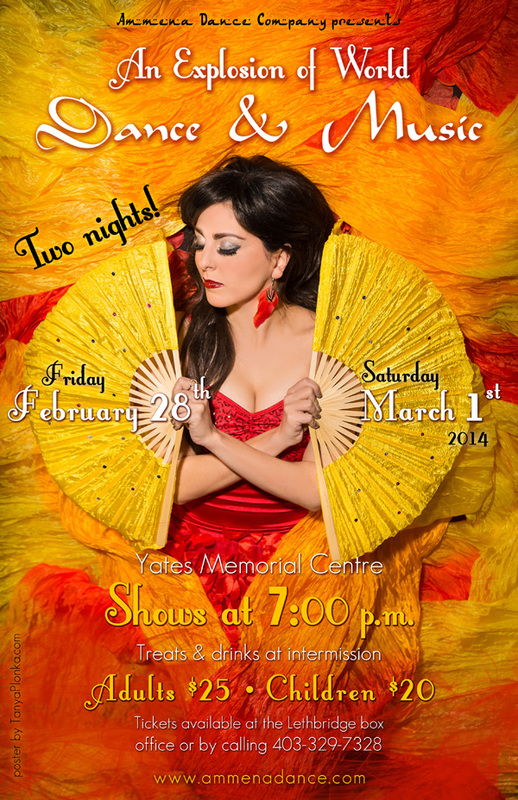 An Explosion of World Dance and Music, our 2014 Lethbridge show! Ammena Dance Company’s “An Explosion of World Dance and Music” 2014 is just about here! Tickets will be on sale on February 4th at the Yates Memorial Centre in Lethbridge and this year we are finally doing TWO shows: Friday February 28th and Saturday March 1st! There are a lot of props being used in the dance pieces this year so it was important to incorporate some of them into the poster. The petals and the fan veils were the most colorful props, so of course they seemed like the most natural fit! Ammena had to hold much less still this year since she had the floor helping her with her poses, so I think she had a much nicer modeling experience (as opposed to last year where I made her hold still for up to 5 minutes at a time!). 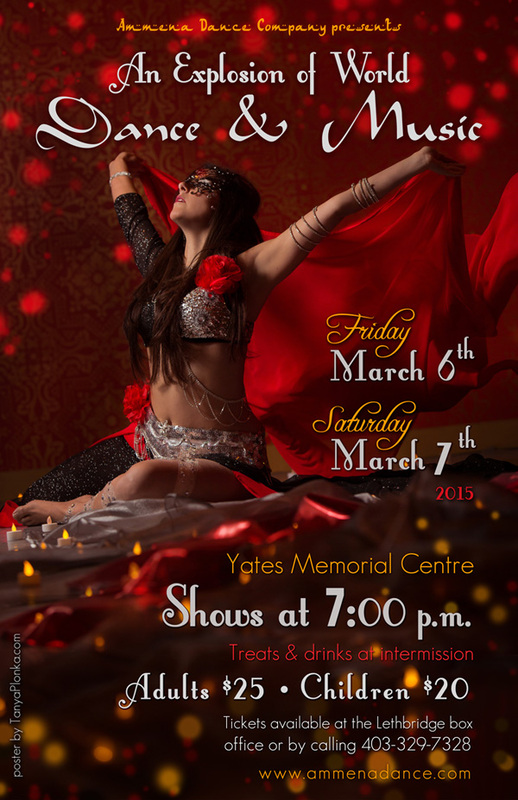 An Explosion of World Dance and Music, our 2013 Lethbridge show! 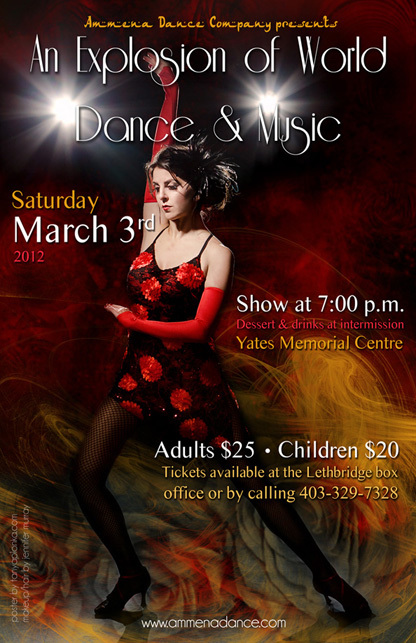 Ammena Dance Company’s “An Explosion of World Dance and Music” 2013 will be taking place on Saturday March 2nd at the Yates Memorial Centre in Lethbridge. With Bollywood and Bhangra being back in a big way this year, our goal was to combine that with more of a burlesque style (another big feature of the show). However, when it came down to poster design, I wasn’t feeling that the Bhangra photos were blending in and just focused on the cute feather showgirl costume that was chosen! Ammena did her own hair and makeup for the Bhangra photoshoot, and the super talented Jenn joined us the next evening to totally capture the classic showgirl look. 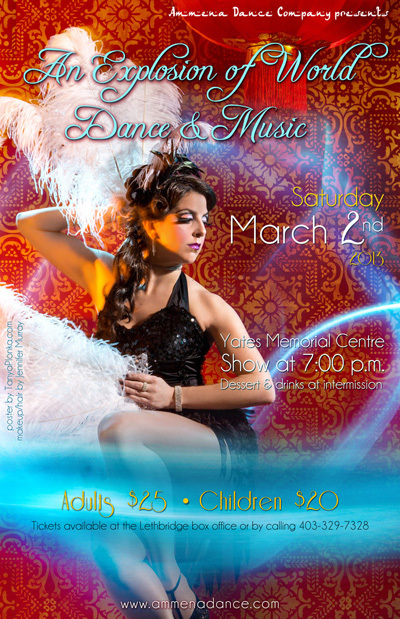 This year’s show is just as diverse as the others, featuring Afro-Cuban, Bollywood, Bhangra, dancehall, jazz, tap, and as usual, bellydance. Sadly I’m not doing a solo this year as I needed to focus on my own wedding planning, but I still found the time to be in four group pieces!